The 106-guest room Four Points by Sheraton Punta Gorda Harborside is located on the edge of the Charlotte Harbor waterfront in beautiful Punta Gorda. Explore the unique shops and restaurants that line the cobblestone streets of the newly revitalized downtown of Punta Gorda. For those who want to wander further down the road, take a short drive to Cape Haze and walk the beaches on the shores of the Gulf of Mexico. When youre ready to return to the hotel, our comfortable rooms await you, plus a fitness center and meeting rooms. After a relaxing meal in our fresh new dining room you'll be ready to head out again and enjoy the sunshine spirit or soft evening breeze of coastal south Florida. Little things in life make a big difference. Like our Simple Pleasures(SM). Get a great night's sleep in the Four Points by Sheraton Four Comfort Bed , refresh with free bottled water daily and keep in touch with free High Speed Internet Access. Kick back with a beer from our collection of the worlds Best Brews(SM) or catch up on some reading over a hot & fresh cup of Seattles Best Coffee. We understand. The best comforts in life aren't complicated. 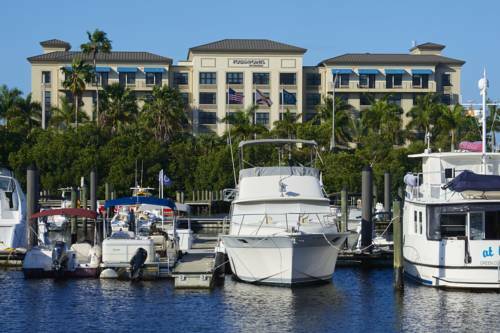 Overlooking Charlotte Harbor, Four Points by Sheraton Punta Gorda Harborside is situated on Southwest Floridas Gulf Coast between Tampa and Naples, and convenient to three major airports. Just steps from the hotel, the palm tree-lined cobbled streets of Punta Gorda offer an open snapshot of the boating towns rich past via outdoor murals, trolley tours, and museums. Restored period homes and vintage streetlights add to the genuine atmosphere, as do the occasional flea market and antique fair. Boutiques, art galleries, and restaurants along the marina and at Fishermans Village invite visitors to relax, refuel, and experience the areas easy charm. Bask in the coasts comfortable year-round sub-tropic climate while exploring Punta Gordas pristine beaches and natural preserves. A celebrated eco-tourism destination and Floridas second largest open-water estuary, Charlotte Harbor is home to a number of endangered species, including the Florida panther, American crocodile, and Loggerhead Sea Turtle. Nearby parks, trails, and bike paths invite visitors to take in the sites, stopping for a picnic along the way. Named one of the 10 Greatest Places to Sail in the United States by SAIL magazine, the harbors serene coves and bays offer plenty of opportunities for kayaking, snorkeling, chartering a fishing boat, or joining a sunset cruise. Directly across from the hotel, Laishley Marina provides a handy place for guests to dock and launch their boats and stock up on maritime supplies. Back on land, the areas golf courses have led Golf Digest to crown Charlotte Harbor and the Gulf Islands the Third Best Place to Live and Play Golf in America. Additionally, sports lovers can play the fan at a Tampa Bay Rays spring training baseball game. A destination for both business and pleasure, Punta Gorda holds hidden treasures for all to find and enjoy. Who doesn t love tasty treats? Satisfy your hunger at our Dockside Grill, featuring American cuisine-best topped off with our one of a kind Firecracker Shrimp! Sample one of our many Best Brews(SM) in our lounge, or warm up with a cup of Joe.